Mercedes SLS AMG E-cell | What Car? Mercedes all-electric supercar, the SLS AMG E-cell, made its first appearance at a motor show in Detroit with the claim from CEO Dr Dieter Zetsche that it will satisfy the two most popular New Year resolutions quit smoking and lose weight. With all-electric drive through four wheel-mounted motors and lightweight construction thanks to a combination of high-stength steel, aluminium and composites, Zetsche warned the Detroit that it will be capable of leaving Americas fabled muscle cars in the dust. It could be out here in a fraction of a second if we could find the traction on our stand, said Daimler research and development chief, Dr Thomas Weber. 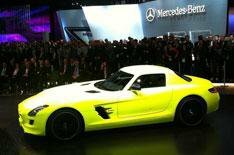 Mercedes also revealed that the E-cell will go into production in 2013. Previously, it had only spoken of the prospect of a small-series production run but at Detroit Zetsche declared that the race to build the best electric sports car is on. The four electric motors deliver 300bhp and 440lb ft of torque in comfort mode, but well over 500bhp and 600lb ft at the touch of a sport button. Mercedes is celebrating the 125th anniversary of the birth of the car - Karl Benzs patent Motorwagen - on January 29, and will mark the event by embarking on a round-the-world journey in one of its hydrogen fuel-cell B-Class cars starting in Stuttgart. The run will take in 14 countries and cover almost 20,000 miles in 125 days, but Weber warned that governments will need to do more to make fuel cells viable everyday cars. There is enough hydrogen in the world today, he said, but the supply situation is similar to when the first gasoline cars hit the roads and drivers had to refuel at a stable. There is no immediately available new product on the Mercedes stand at Detroit the company is keeping its powder dry for the Geneva show in March, when it will unveil the revised C-Class range, including a new coupe. However, a design sculpture that is said to give pointers to how it will develop new interiors inspired by nature, aesthetics and aircraft construction is on display.